The long summer days of going out at 7pm and still seeing the sun in the sky have been gone for quite sometime now. The chill that used to tease us at night, is now lingering in the day like a drunken uncle lingers around a turkey at Thanksgiving. Although it is still technically fall, winter is knocking at the front door. The nights of 파전 (pajeon) and 막걸리 (makgeolli) outside while watching the world go by must be put on hold until the spring. Now is the time to seek refuge indoors. Samgyetang is the perfect dish to warm up to on a cold night. On Monday, the first flakes of snow began to fall in Seoul, so I thought it was appropriate to head down to one of the liveliest places in Seoul, Myeongdong, for a little samgyetang, some pajeon and a nice bottle of soju. The LP suggested Baekje Samgyetang, and after work, I was off to Myeongdong to meet the great KM for dinner and drinks. LP’s Description: LP notes the Chinese characters are key. 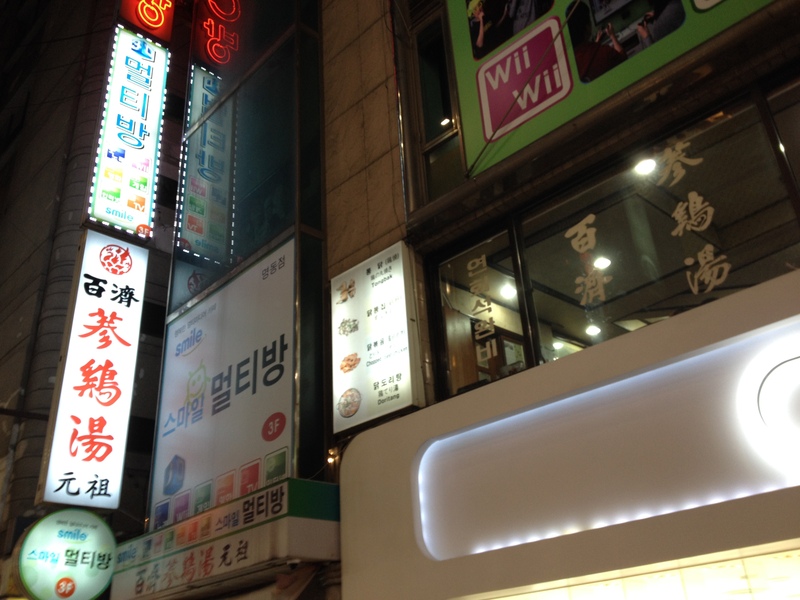 However, there are lots of restaurants in Myeongdong with Chinese characters. LP also states that Baekje Samgyetang offers quality samgyetang and that we should try to the herbal soup at the end. Finally, they suggest we try a little insamju (ginseng wine). How to get there: Oh boy, here we go, another hunt to find the restaurant. Thankfully I was with a Korean speaker. She called the place and they gave us proper directions which I will now pass on to you gentle reader. First take the subway to Myeongdong (Line 4) and depart from Exit 6. Now make a left and walk down the main alley with tons of vendors and name brand retail outlets. 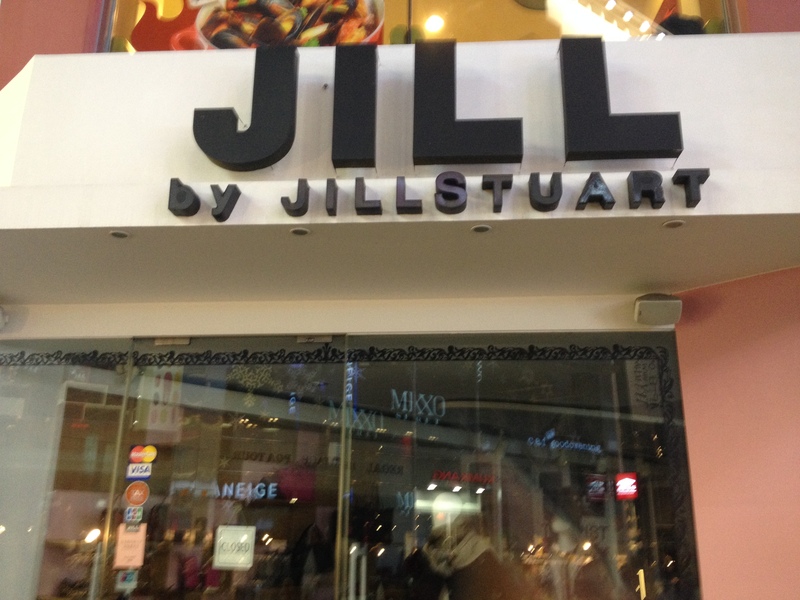 You should keep walking until you see a Jill Stuart designer store on your left. Make a left. Walk for a bit, and the restaurant is on your right, on the second floor. If you have walked to the Myeongdong theatre, you have gone too far. The store named after my lovely wife. 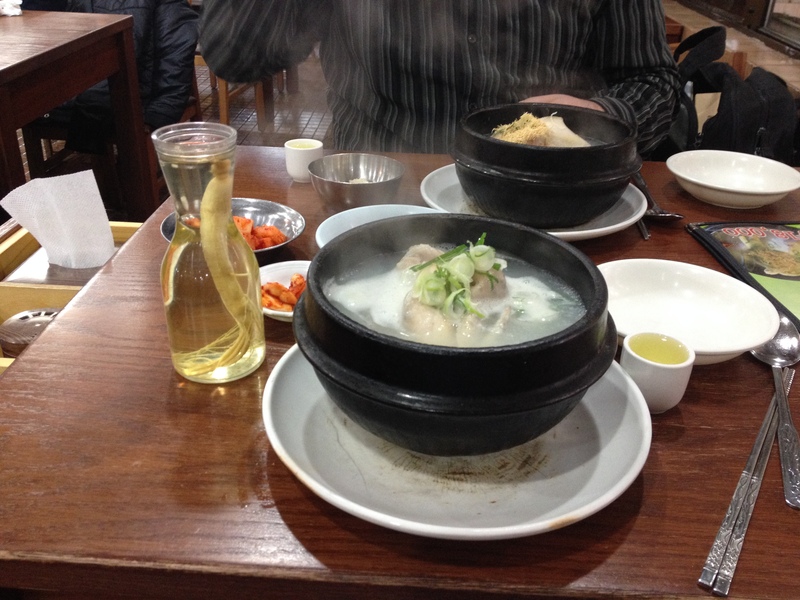 Atmosphere and Service: Baekje Samgyetang is a bustling restaurant. The moment you walk in, you are greeted with a friendly smile and can sit wherever your heart desires. There is lots of conversations, between patrons and between the kitchen and the wait staff. It is a fair cry from Tosokchon (토속촌), which was pretty quiet, traditional and had a formal atmosphere. The decor is simple and clean. If I had to describe it in one sentence, I would say it is like walking into an adjumma’s house who has been mastering the same recipe for fifty years. There is nothing fancy about the setting because the food is the lead character in this play. The service was good. We received our sides almost immediately after sitting down. Our meals arrived a few minutes after ordering. Our drinks were served quickly, and the server was polite, and even engaged in a little light bantering with KM. It felt like I was sitting with my aunts, having a few drinks and some laughs. 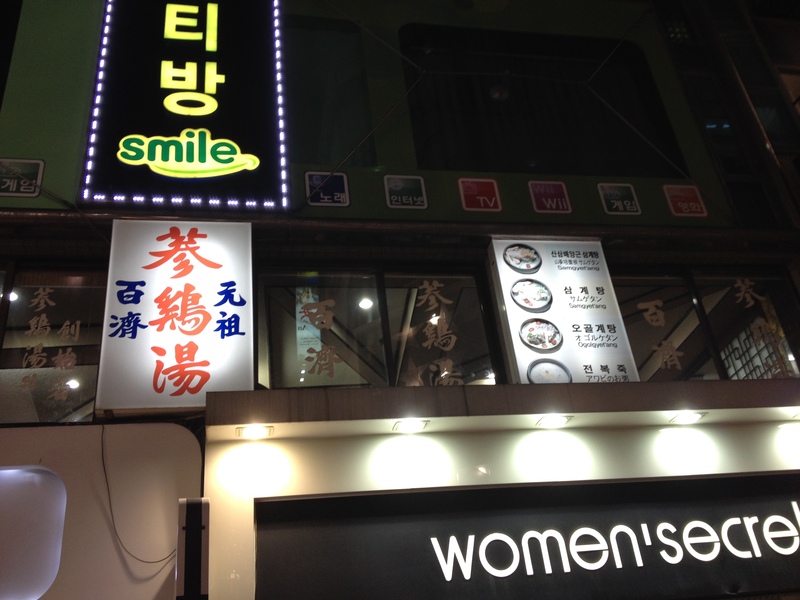 Baekje Samgyetang has nice, friendly and easy going service despite the hectic atmosphere. 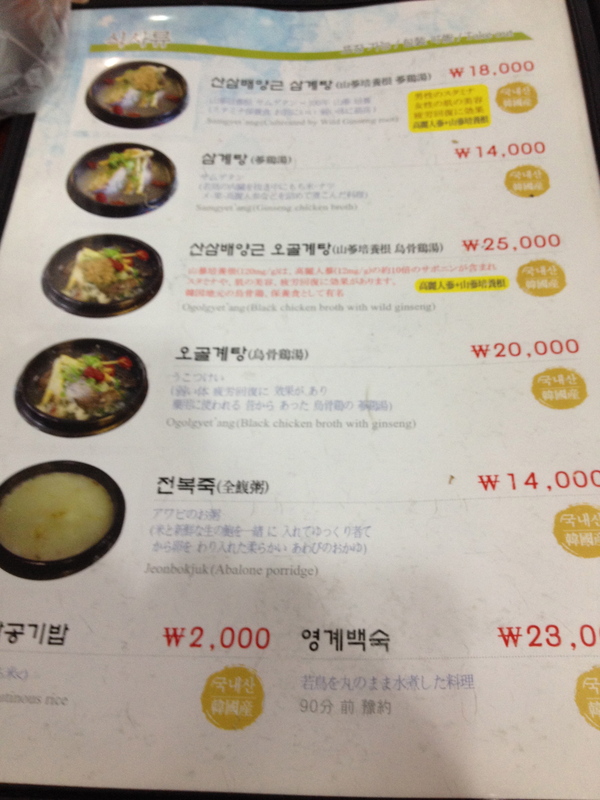 Food and Drink: We ordered the pajeon, regular samgyetang, ginseng samgyetang, and a bottle of ginseng liquor. 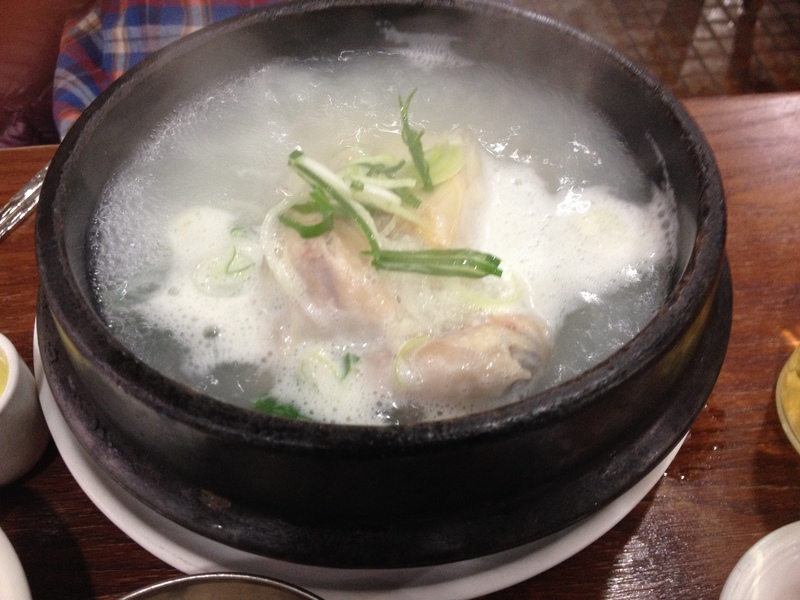 Samgyetang – 14000KRW: The samgyetang is what you would expect if you’ve had that Korea dish before. I didn’t notice too much of a difference between the samgyetang they served here and the samgyetang that they served at Tosokchon, but Baekje Samgyetang appeared to be a little more fatty. A few times, KM picked off the skin from the chicken and I don’t remember that from my experience at Tosokchon. That said, the chicken was well cooked and stuff with rice, a plump and various other herbal, medicinal-related goodies, including the ginseng root. Ginseng Samgyetang – 18000KRW: Sprinkled with shredded ginseng, the yellow ginseng accentuates the dish. Viewing the dish makes the recipient of it feel warm and comfortable, like the homemade bowl of chicken soup that grandma would bring out for you when you were sick. I mixed the ginseng with the rest of the soup. 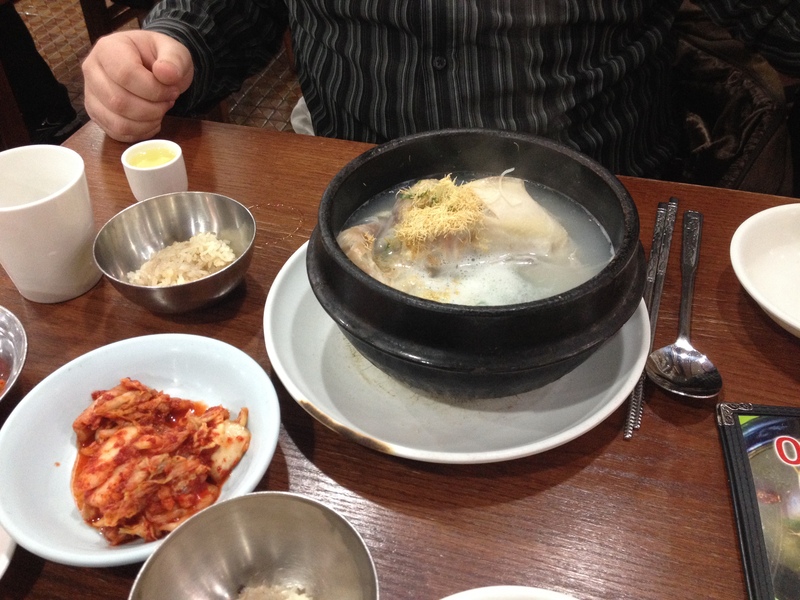 I’m not much of a samgyetang aficionado, but it didn’t seem to be a problem with my guest. The flavors are not overpowering. As the LP suggests, and I completely agree with them, is to mix a bowl with salt and pepper and then dip the chicken into it to give it a little flavor. Without the salt and pepper, the samgyetang is bland, even too bland for my taste. The rice and stuffing were great, and as always, I felt healthier after eating it. My only complaint would be the fat on the chicken. The chicken at Baekje Samgyetang seemed to have more gristle and fat than at Tosokchon. 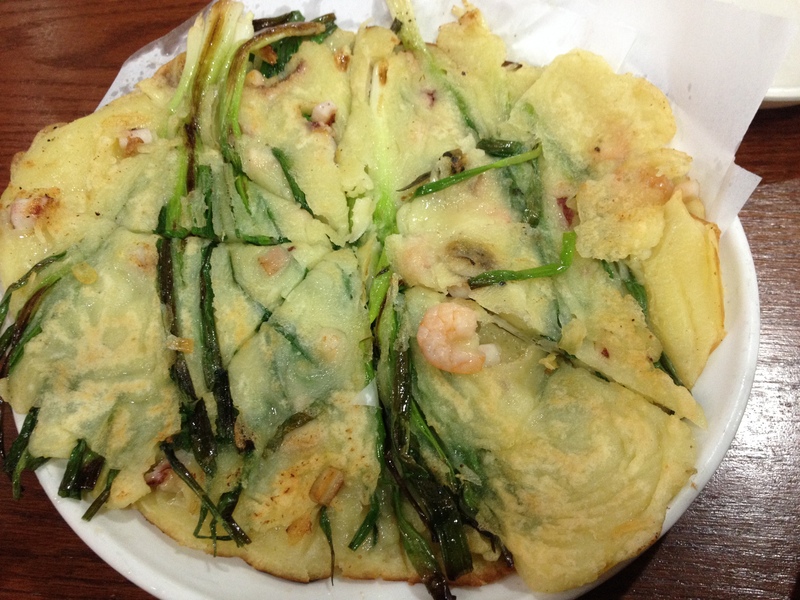 Pajeon – 10000KRW: Pajeon and I have a complicated relationship. Pajeon is like the old college buddy you really want to hangout with until he arrives. Then you find yourself asking, “Why did I invite this guy over again?” Although I love the thought of pajeon, when it actually arrives at my table, I find myself feeling regretful. Why? For some reason I get it in my mind that pajeon is seafood free. However, pajeon ranges from Forrest Gump’s boat before the hurricane to Forrest Gump’s boat after the hurricane (A little to overwhelming amount if you don’t get the movie reference). In this case, the pajeon had just enough seafood not to take away from the taste of the onion and other ingredients in the pancake. The pajeon was nicely baked, light and fluffy with little or no grease. It was also quite thick. Oftentimes, I’ve had pajeon that has the thickness of a piece of paper, but this pajeon actually looked like a real southern pancake. For the seafood lovers out there, shrimp and scallops were the main components of the pajeon. Sides: Not too many sides, but enough to pick away. Kimchi, garlic with chili sauce and sticky rice were plentiful and complimented the meal well. Drinks: We decided to get a small bottle of ginseng liquor. It was very nice and complimented the meal well. You could really taste the ginseng, which did not overpower the flavor of the soju. The burn going down the throat, which also lingered on the tongue after, was a nice warm feeling on a cold night. Baekje Samgyetang’s menu had an diverse selection of liquors, including a Japanese apricot liquor (Plum Brandy was the comparison the menu stated), Korean raspberry wine, and of course Baekseju (Soju flavored with ginseng). 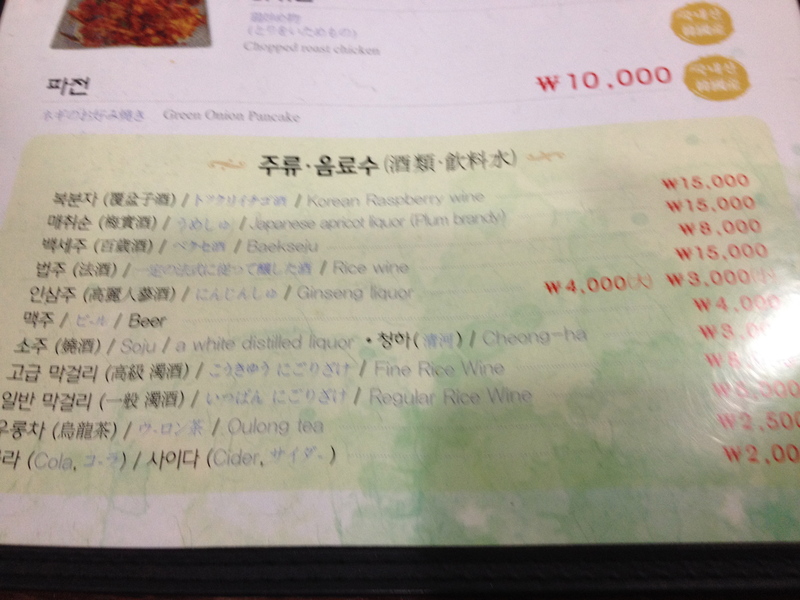 All drinks ranged from 2500KRW – 15000KRW. 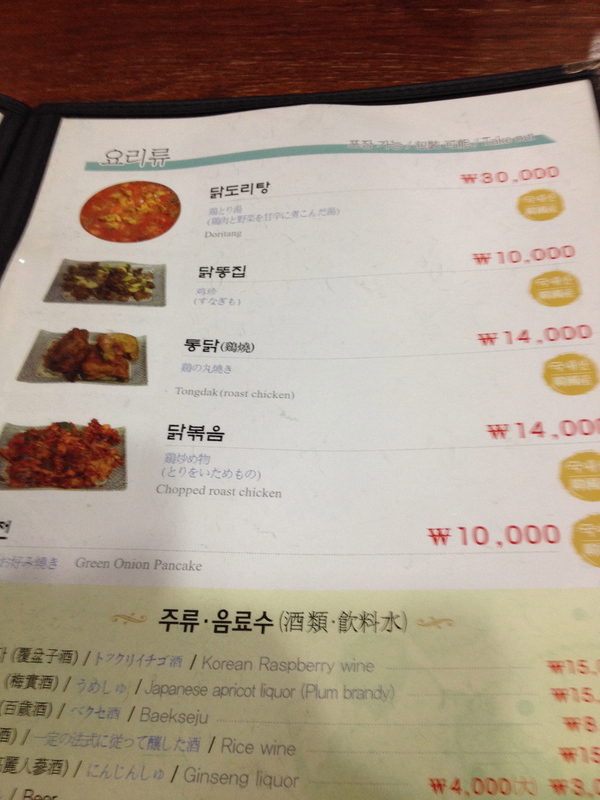 Value: The total bill came to 46000KRW. In my opinion, for two people including a side dish (pajeon) and two chickens, and a bottle of ginseng soju, this was a pretty reasonable deal. Some might argue that there isn’t a good food to cost value, but I would argue that compared to the chains around Korea, this is actually a fairly reasonable deal. It’s fresh, it’s homemade and the restaurant is casual and comfortable. If you are looking for a warm culinary hug on a cold night, I would recommend this place. Who should visit Baekje Samgyetang: Needing a quick fix of something that resembles chicken noodle soup? Check this place out. Also, if you are looking for non-threatening (aka non-spicy) Korean food, samgyetang is an excellent place to start. Who should avoid Baekje Samgyetang: There are a lot of samgyetang places in Seoul, I don’t know if I would go out of my way to visit unless I was in the neighborhood. Also, you might want to leave the kids at home. I didn’t see any kids around, and the menu is catered towards big boys and girls. Great write up! My wife and I just had samgyetang last week to help us warm up a bit, and it did the trick. Delicious and healthy, indeed. I’ll have to keep my eyes peeled for the ginseng liquor, I don’t think I’ve seen that yet. Thanks for reading Thomas! The ginseng liquor was a very nice compliment to the samgyetang. Most Korean places have a variation called Baek Seju which apparently is known as “100 years wine” because it has so many medicinal elements, if you drink it everyday, you will live to 100. That would be a fun one to test out. haha sweet! i’ll look around for the miracle drink next time we’re out, and we’ll drink for the sake of being healthy. I always mix salt & pepper on the side and dip the chicken in it, it does taste much better that way. and of course pajeon means seafood 😛 I’d kill for some greasy, sea-food filled, pancakes right now!